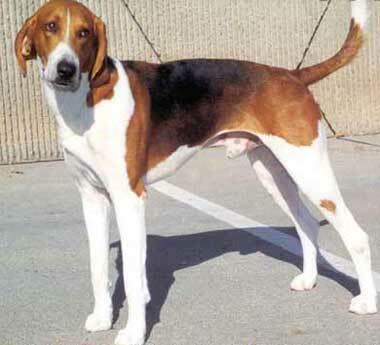 American foxhound from Wikimedia Commons (use permitted with attribution / share alike). American foxhounds were developed in colonial times by landed gentry purely for the sport of hunting foxes. 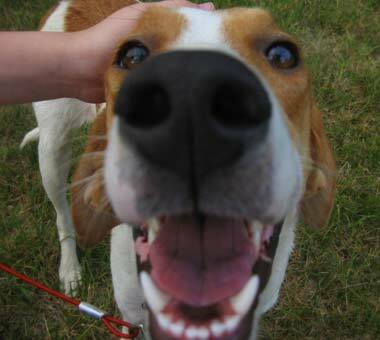 Today there are several different strains of American foxhound (including Walker, Goodman, Trigg, July and Penn-Marydel) that differ in appearance but are all recognized as members of the same breed. American foxhounds come in four colors: red, tri, black and tan, and blue. Known for a sweet, kind, loyal disposition, the American foxhound requires ample exercise - a bored foxhound will find ways to keep itself entertained, often including destructive behavior (not a dog that should be left alone indoors for extended periods of time). As with all hounds, foxhounds need careful training and constant socialization. American foxhound with big smile for camera - photo © nick4900 on Flickr - noncommercial use permitted with attribution / no derivative works.